As Parliament closes for the summer, Theresa May will be hoping that the break puts an end to the Tory infighting and plotting that has dominated the front pages ever since the country gave her a vote of no confidence at the general election. George Osborne had it right – she is a dead women walking. Labour, by contrast, continues to gain momentum. Poll after poll now puts Labour ahead of the Tories. Our summer will be spent not in an internal civil war but reaching out to hundreds of thousands voters in 100 key marginals that we are focussed on winning in order to get a Labour government at the next election, whenever it’s called. Central to our summer campaigning blitz will be the message of hope that our manifesto offers. We have real solutions to people and families that are facing economic insecurity, falling wages, rising costs and worsening public services. Our manifesto is perhaps the clearest indication of the shift in the party’s direction under Jeremy Corbyn. It was certainly the reason for greatest increase in our vote since 1945, with Labour gaining 3.5 million extra votes. Given there were around 1.5 million additional voters this indicates that Labour won support not only from former non-voters and new voters but from across the political spectrum. The more people get to hear about our positive vision over the summer the more they will be won over. The Tories and their allies in their commentariat understand this and are desperately seeking to blow us off course. That’s why there is now a concerted campaign from Conservative Party HQ to misrepresent our manifesto – such as this week’s dodgy and disingenuous claims over our popular and fully-costed tuition fee pledge. But even those desperate attempts by Tory minister Jo Johnson – echoed across the Tory press – reveal an interesting truth: it’s Labour that is setting the national political agenda. The Tories have no plan for government of their own. So fearful are they of taking something to the floor of the House of Commons and losing a vote, they are instead focusing on opposition to Labour’s plans. The summer silly season will no doubt see more misrepresentations of Labour’s positions. Inaccurate claims that our strategy is “one more heave” – which no serious Labour activist has ever advocated – or that Labour lost support from the “white working class” are part of these efforts to get us to change course. 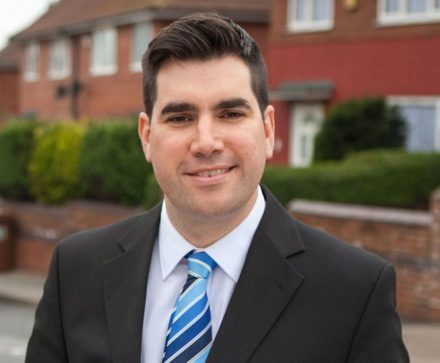 I invite those media talking heads to come to my constituency – which is predominantly made up of working class people who happen to be white – and where we secured the highest vote for Labour in almost 40 years. As can be seen from the graph below, my constituency was no one-off. 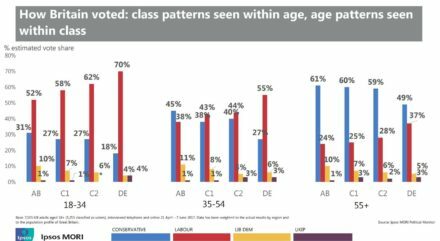 Labour won in every social group amongst those aged under 55, with the exception of the wealthiest ABs aged 34-55. Of course there is much more to be done, for example among older voters. Likewise, in Scotland, Labour added around 10,000 votes, but the SNP lost nearly 500,000 votes, so there are real opportunities to rapidly grow Labour’s support amongst voters who are now seeing through the SNP and can be confident that Labour is the real anti-austerity option. With our manifesto we should believe that we can win over the overwhelming majority of working people – both working class and middle class – and other groups such as students, the self employed and pensioners who have all been let down and held back by this government. The largest ever round of Labour campaigning outside of a general election is aimed at such voters. Big hitters in the Tory party like Amber Rudd, Iain Duncan Smith and even Boris Johnson are all vulnerable to Labour’s campaigning. Labour’s determination to be a party of the many, not the few, will mean that no-one in the Tory party will be able to rest easily this summer.